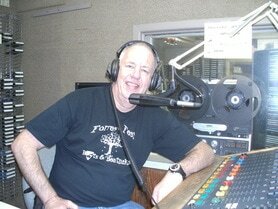 An international poet, he is pictured in the studio of KPET local radio for the town of Lamesa, Texas, in 2013 where he did a series of programmes promoting the local Forest Fest Poetry Festival. Real name Trevor Wainwright: He is based in Castleford, West Yorkshire and began writing poetry over 20 years ago to record his time in the Fire Service, a calling the selection “Fire Service Follies” he still writes them today when he has a “memory jolt” . He diversified into community poetry and has written on have written on a variety of subjects, not all of them popular including AIDS and ME, the purpose being to raise awareness and greater understanding. His poems on the subject have been published to worldwide acclaim, in fact they went abroad before he did, and have been well received by those involved in the illnesses. He has also been part of reading teams to raise awareness of the illnesses and funding into research. In 2004 he wrote a poem called African Anguish to highlight the plight of the people of Africa and to criticise the work done by the G8 Countries, it was at the time hailed as his greatest work and sold well providing life saving inoculations for hundreds of African children. Taking the name “Trev the Road Poet” during a 2012 tour of America when he wrote 175 poems about it, 161 on the tour itself gaining himself the reputation as the UK’s most Prolific Travelling Poet and is also known as “The Rhymey Limey”. To date he has visited America five times and written733 poems about his visits including the preparation. In 2013 he was invited to recite at the Townhouse Museum, Matamoros, Mexico, the first UK poet to recite there. In 2015 he garnered the name Trev the Minuteman Poet for his ability to come up with a poem within a minute of being inspired. A regular on the local open mic scene where he has a reputation for writing purely on inspiration on hearing something at such events, he says of his poetry: In addition to writing about my journeys and everyday events, I like writing poems about the clever their comeuppance and the underdog coming out on top. I also enjoy performing my poems and others, and can think of no better tribute than when having read one of my poems at an event, someone asks me to read one of theirs. I have read in front of Bishops, MP's, Mayors, Councillors, in churches, theatres, cafes, pubs, outside in the streets, in parks, when on tour I carry pencil and book with me so I can write when inspiration strikes, which on tour is quite often, I have often been likened to the late John Denver for this, something which pleases me greatly. Having my material with me also means if anyone shows interest I can do an impromptu recital for them which is always greatly appreciated.